Australiana and American Barns feature a durable and robust construction while providing an old period charm. 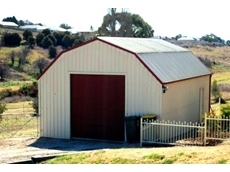 Tumut River Sheds offer farm sheds, machinery sheds, barns, hay sheds, storage sheds, carports, verandahs, garages and aircraft hangers to the rural, residential, commercial and industrial sectors. National Sheds is an Australian business that produces high quality steel buildings made from Bluescope Steel. National Sheds specialises in designing custom sheds using a shed software programme to suit and create shed designs to specific specifications. The Big Shed Specialists offer a wide range of sheds, garages, barns and shelters; to suit individual requirements. World of Sheds provide a range of sheds, garages and carports to the rural, residential and industrial sectors. Their products includes farm sheds, hay sheds, machinery sheds, residential garages, carports and industrial buildings.